The Chinese saber comes in a great variety of curvatures, profiles, and with different combinations of grooves and bevels. Oddly, surviving historical texts don't tend to mention these differences or give names for them. This is probably in part because the choice of saber style was free for many officers and soldiers. Regulations therefore only mention those parts that were regulated like total length, color of wrap and material of the fittings. The lack of official terms doesn't remove the need for collectors to want to differentiate styles so in recent decades they came up with a variety of names to classify these sabers until their proper names are found. Thus, the saber with a clipped tip is now commonly termed yànchìdāo (雁翅刀) or "goose wing saber". The likeness seems far-fetched at first but there is some merit to the term. There is mention of a yànlíngdāo (雁翎刀) or "goose feather saber" in a poem written by Ming emperor Jiajing (ruled 1521 to 1567) about sending off one of his favored generals, Mao Bowen. Soldiers were often likened to geese, and when a soldier died it was sometimes said he "left the flock of geese".1 Perhaps soldiers were likened to geese because they, too, tend to move in formation and in the old days campaigns were often seasonal, like the trek of geese. 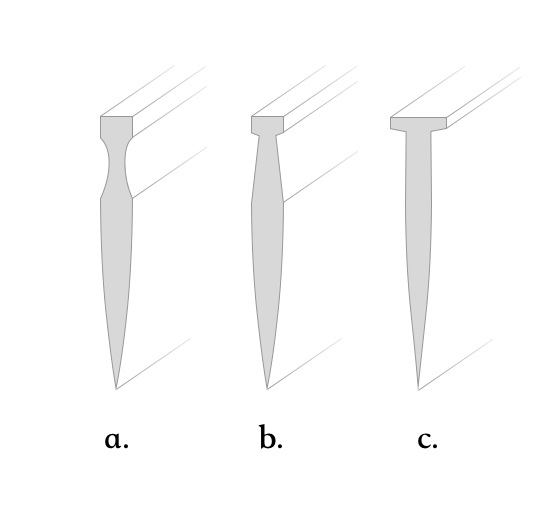 Read more about saber classification in my article: Chinese saber typology. 1. Nicola Di Cosmo; The Diary of a Manchu Soldier in Seventeenth-Century China: "My Service in the Army", by Dzengseo , Routledge Studies in the Early History of Asia. Page 87. 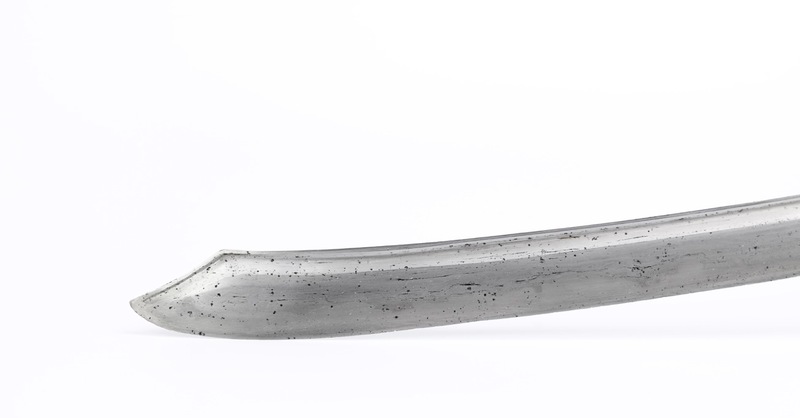 A very rare and early yànchìdāo blade with interesting features. 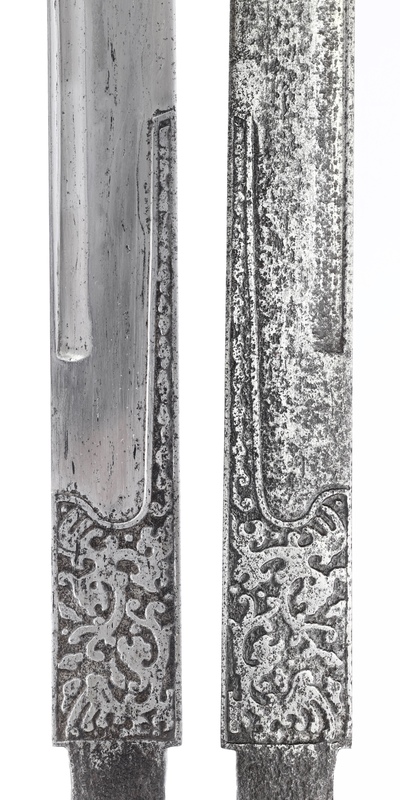 At the base of the blade is an engraved tūnkǒu (吞口) with it's lower "jaw" extending for 14.5 cm, 2 to 3 times longer than common for this design. Its interior is chiseled with archaic designs of flying phoenixes that reminds of their representation in the Han dynasty (206 BC–220 AD). The blade has a single, long groove on each side that follows the entire contour of the back, even drooping down the last section towards the tip. It is not cut in a conventional manner. It's not as much a channel as it is a depression that starts sloping down from a well-defined ridge line, and stops just under the blade's spine. This construction gives the blade an unusual cross-section with a mildly T-shaped spine. Such a spine is a feature seen on some daggers and swords found on the border regions of former Persia and north India. A: Conventional groove on a Chinese saber. 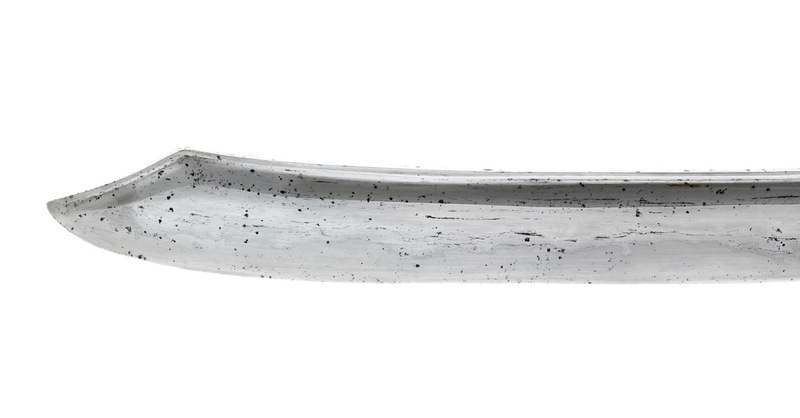 C: Blade cross-section of a north Indian khyber sword. There is a comparable yànchìdāo with very similar tūnkǒu published in Huangfu.1. The base of that blade is different, but the last secton is almost identical to our example here. Is fitted in what could well be original early fittings, or a later Qing revival of the Ming style. 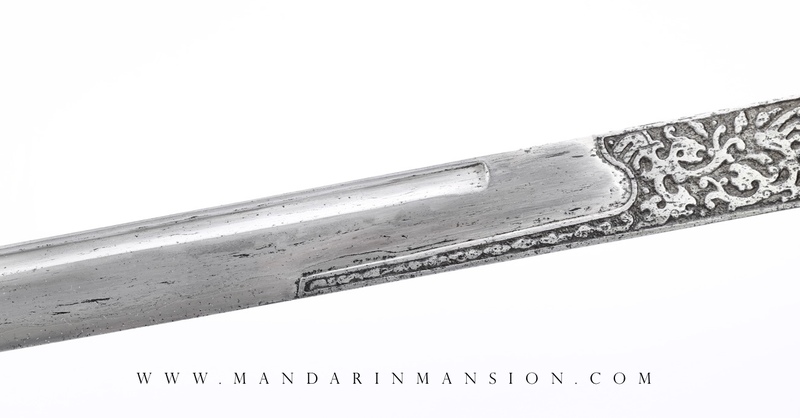 Our blade is polished on the left side, showing the techniques used in the construction of this fine example of late Ming swordsmithing. It reveals a subtle layered structure with an inserted high-carbon edge supported by many layers of forge folded steel. The layered steel has a grainy structure that is caused by the use of a flux out of straw ash, instead of borax, creating series of openings along the grain. These are not to be mistaken for forging flaws, where the layers didn't bond due to pollution in the steel or lack of heat. This grainy structure is an inherent product of traditional Chinese swordsmithing before borax became widely available through maritime trade. In the right light, one can also make out a sharp line almost in the center of the blade, demarcating the differential heat-treatment where one side was left to cool much quicker than the other, resulting in a hard edge and a softer spine. The effect is known on Japanese swords as hamon . The other side is left in "as found" condition, with only the active rust removed and its patina stabilized. The blade is of good quality and in excellent condition for its age: No nicks, no excessive pitting, no significant disturbances in the blade's contours or bevels. It comes in a wooden resting scabbard. Polish and scabbard by Philip Tom. A word to the wise: I know a lot of collectors would like this mounted up in later or reproduction fittings. I think this piece deserves to be appreciated "as is". 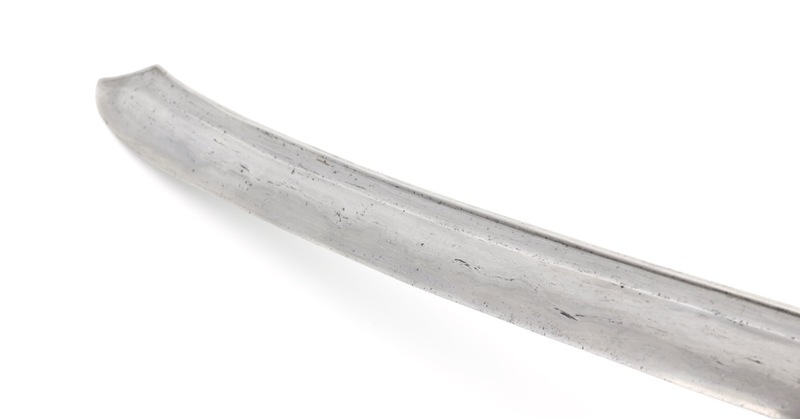 An very well-preserved Chinese saber blade, probably dating from the late Ming. It is of a rare and early form with interesting decor and design features. Such blades are exceedingly hard to find on today's market. 1. See Jiang "Alex" Huangfu; Iron and Steel Swords of China (中国刀剑), Tomorrow Publishing House, 2007. Page 87.